While most photographers can’t wait to get to Yosemite or some grand vista, I am quite happy at the city dump. This is an old shipping container splattered with paint, years of dirt and more paint and then this beautiful weed. I could ask for no more. The camera does not lie, I have seen dragons in all their wrath. Which was my eye drawn to first; the Mondrianesque stained glass window or the shadows from the overhanging roof tiles? I believe that intuition was at work here saying this is an image you must take home. It is something that happens in a fraction of a second. This photograph was pure luck; I never have my camera on motor-drive. So to capture the moment of touch down with one claw and wings folded up, that’s pure luck. But there is something to be said for being prepared. I saw this guy at the Amador County Fair and he brought a smile to my face and continues to do so every time I look at this photograph. While other photographers are happy in the grand landscape, finding something like this old glove makes my heart race. I found this glove so wonderful, that I brought it home; I hope someone won’t miss it. The shadows cast onto the sidewalk created a better photograph in my mind’s eye than the real thing. When I photographed this window it was the broken leaning piece of glass that caught my eye, but on further viewing, I saw the profile of a person wearing a baseball cap. A beautiful simple shape with many years of paint to add to the gesture. Finding this old broken window was such a delight that I lost myself for some time while I tried to find the best gesture. A straight print of a rock formation, just dodging and burning and contrast adjustment. I see no need for fancy software to distort reality, when nature is far more creative than any artist has ever been. When I photograph something I usually have pretty good idea in my mind of what I am after in a final image. But on occasion I can be very surprised. 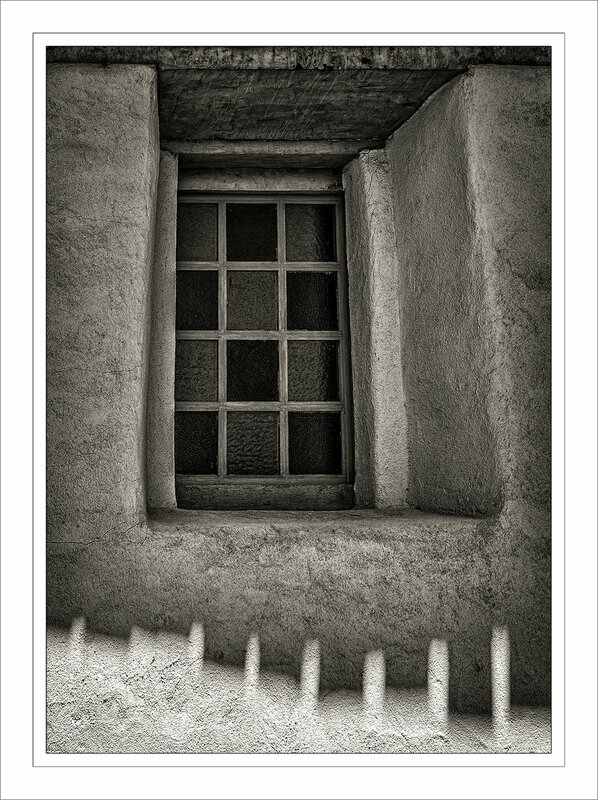 The wall and window in front of me held an air of mystery for me and I was very surprised and pleased at the outcome. You just have to wonder why the two windows have the drapes closed. While raking leaves for the compost pile, this leaf stood out and said save me. I photographed it against a white piece of mat board and then applied textures for the background. An old dilapidated venetian blind, the cords rotted away. To me it felt like a musical score.